Dr Kelly MacDonald read Anatomy and Medicine at University College London and obtained Membership of the Royal College of Surgeons, prior to specialising in Radiology. Kelly completed her training at the Severn School of Radiology, Bristol, and undertook a Fellowship in Abdominal Imaging at Vancouver General Hospital, Canada, prior to her appointment as a Consultant Radiologist in Bath. 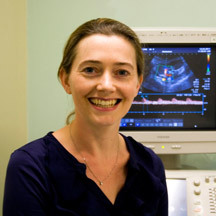 Her major clinical interests include cross sectional and ultrasound imaging of abdominal and pelvic disorders, including Transvaginal Ultrasound, CT Colonography and MRI of the Liver, Small Bowel and Pelvis. Kelly has also been instrumental in setting up and running the Pelvic Floor Imaging Service, which uses MRI to assess functional disorders of the pelvic floor, including pelvic organ prolapse, incontinence and obstructed defecation. Kelly is also involved in medical education, and has been part of a team facilitating the integration of Radiology into the undergraduate anatomy curriculum at the University of Bristol Medical School. In addition she is also an Academic Mentor to the universities medical students.